Poster at Celebrating Reproductions: Past, Present and Future, Victoria and Albert Museum, London, UK, 17–19 January 2019.Kira Zumkley, Karina Rodriguez Echavarria, Tim Weyrich, Marion Crick, Charlotte Hubbard, and Sarah Healey. 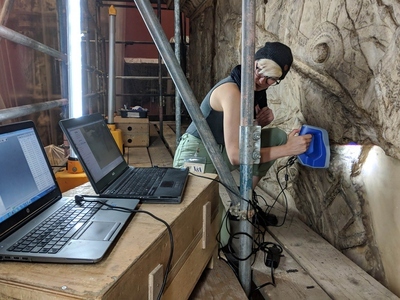 Conscious digitisation: Supporting the conservation and interpretation of the V&A’s collection of large-scale reproductions. In Celebrating Reproductions: Past, Present and Future. Poster, January 2019.Zumkley, K., Rodriguez Echavarria, K., Weyrich, T., Crick, M., Hubbard, C., and Healey, S. 2019. Conscious digitisation: Supporting the conservation and interpretation of the V&A’s collection of large-scale reproductions. In Celebrating Reproductions: Past, Present and Future. Poster.K. Zumkley, K. Rodriguez Echavarria, T. Weyrich, M. Crick, C. Hubbard, and S. Healey, “Conscious digitisation: Supporting the conservation and interpretation of the V&A’s collection of large-scale reproductions,” in Celebrating Reproductions: Past, Present and Future. Poster, Jan. 2019.